Government of Kerala, Office of the Commissioner of Entrance Examinations invites application for the Entrance Examination for Admission to Integrated Five Year LL.B Course 2014-15 in the four Government Law Colleges of Kerala and in the Private Self-financing Law Colleges of Kerala. The Entrance Examination will be conducted in Thiruvananthapuram, Ernakulam, Thrissur and Kozhikode on 28.06.2014(Saturday). The duration of exam will be 3 hours (10.00 am to 1.00 pm) and will consist of 200 Multiple Choice Questions. The questions will cover General English, General Knowledge and Aptitude for Legal Studies. Should possess such academic qualifications which are considered as equivalent to such 10+2 Course by the Bar Council of India, with a minimum of 45% marks (40% for SC/ST). Candidates who are appearing/have appeared for the qualifying examination this year are also eligible to apply, subject to the condition that they should produce the pass certificate and mark list of the qualifying examination at the time of admission. The applicant should have completed 17 years of age as on 31.12.2014.There is no upper age limit for admission to the Integrated five year LL-B Course. 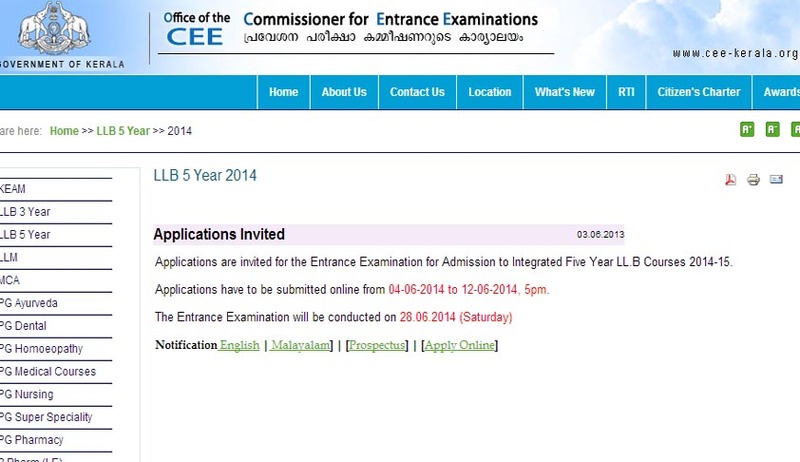 Candidates seeking admission to the Course can apply online on the website www.cee.kerala.gov.in of the Commissioner for Entrance Examinations. The website will be open for online registration from 04.06.2014 to 12.06.2014, 5 p.m. Candidates should take printout of the online-submitted application and affix a recent passport size photograph, identical to the one uploaded, in the space provided and get it attested by a Government Gazetted Officer. The application along with the requisite documents should be forwarded to the Commissioner for Entrance Examinations, 5th Floor, Housing Board Buildings, , Santhinagar, Thiruvananthapuram – 695 001, in A4 size envelope either by registered post/speed post/hand delivery, so as to reach the office before 5 pm on 13.06.2014 (Friday). The envelope should be super scribed “APPLICATION FOR INTEGRATED FIVE YEAR LL.B ENTRANCE EXAMINATION 2014”. For General and SEBC candidates, the application fee is Rs.600/-(Rupees Six Hundred Only) and for SC/ST Candidates the application fee is Rs.300/- (Rupees Three Hundred Only).The required fee can be remitted at any branch of the State Bank of Travancore using the Bank Chalan, which is available along with the online application printout. Law Colleges in India, Law Colleges in Kerala, Law School News, LLB Entrance Examination 2014, Kerala LLB 5 Integrated Course.